Irish theme has ruled the slot gaming world for a long time now. In a way it makes perfect sense too as Irish culture celebrates luck and gold which are the core elements of gambling. 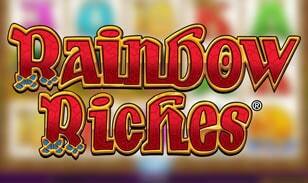 Rainbow Riches slots based on Irish culture is produced by Barcrest, this game comes with three bonus features. Barcrest is a known name in the offline gaming industry especially with chip shops, cafes and game parlours. They have ventured in online gaming and have designed some popular slots like Cashino, Lucky 5 Reeler, Monty’s Millions etc. Rainbow Riches slots have 5 reels and 20 pay lines. As the game is Irish in concept, reels are filled with leprechauns, pot of gold, rainbow, wishing well and other card symbols like K, Q, J and A. Betting range per spins starts from 0.05 and goes up to whopping 400, in your respective currency. Graphics may look a bit dated as compared to the current lot but they justify the theme. They are bright and bold. The interface has reels in the centre and play options in bottom. Paytable has the details of all the winning combination and the pay lines. Auto play option is also available. The highlight of Rainbow Riches slots is its three bonus games. Road to Riches Bonus game: To trigger this, the player needs three leprechaun symbols anywhere on the reels. In this bonus feature, the player is taken to a separate screen where is a wheel of fortune in front of a path with increasing multiplier. Player spins the wheel of fortune, if the result is between numbers 1 to 6, the game continues. If the result is to ‘collect’ the feature ends. Number 1 to 6 symbolises the multiplier amount player can receive. Wishing well Bonus: Landing three wishing well symbols will trigger this feature. The player has to select any one of the wishing well and it reveals the bonus multiplier for the player. Pots of Gold Bonus: Landing pots of gold on reel two, three and four will trigger this feature. In this, 12 pots are revolving around a leprechaun and the pot that stops in front of him is the player bonus win. It contains a multiplier and will be added to the winning.